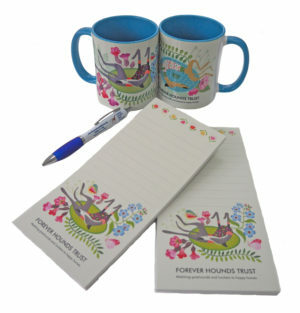 Designed by Rollerdog exclusively for Forever Hounds Trust, this notepad is one of a range of gift items in this beautiful design featuring a lurcher happily rolling around without a care in the world! A handy to-do list pad or shopping list pad – the perfect greyhound gift or lurcher gift for anyone who loves these wonderful dogs! This item forms part of a range of gift items (coming soon) in this design, including mugs, tea towels, aprons, tote bags, notepads and gift wrap.